We have a paint-by-numbers lightbox of The Last Supper at work where I lay my sweater or coat every day, as if piously leaving a warm offering. The Jesus Lightbox resides atop an old, dusty file cabinet, facing another old, dusty cabinet that houses plastic dinnerware, a glue bottle that dons a Post-It note reading "Sniff me to forget about work", and wicker organizational baskets filled with chili sauce, soy, and Sweet 'N Low packets. My horoscope said to take some time out and free-write about what direction I want my life to go in. According to Feng Sui, south is a great way to lay your head at night to maintain harmony in relationships. We have water in the southest corner, but little can be done to help this due to the fact that it is a large body of water called Lake Michigan. I would love to work freelance jobs writing and then start auditioning for films/shows. I'd love to make some of my own 8mm films (I have a great, old camera from my grandfather purchased at Corvette's in the '60s) publish some books, cut my spoken word CD. Plenty of fiber. 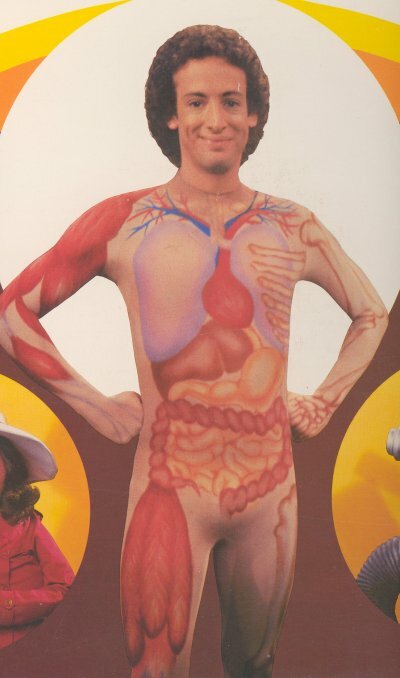 Look at Slim Goodbody. He looks pretty self-actualized. Dabney Coleman. Cloak & Dagger, War Games, & the little-known, but cinematic departure into the avant garde, Bad Ronald. I always dug him.